Life is not always a bed of roses, but as long as we stay focused and driven by our passion and purpose, all of us can do remarkable things in our own way. Meet Aziza, who has been through the ups and downs of life: From a relief teacher to a secretary, and later, a culinarian who was forced to end her business – the first Malay fine-dining restaurant in Singapore. Nevertheless, Aziza never gave up on her passion and became a self-taught artist. Today, she is also a food consultant and have written three books on food and heritage, and was inducted to the Singapore Women’s Hall of Fame in 2016. Come and listen to Aziza as she shares with you the driving force behind her achievements. Living well is more than just maintaining good physical health – emotional wellness, happiness and a sense of fulfilment. As we transit from one life stage to another, we have to adapt to changes in our body as well as changes in our role in the family and society. This transition can be a source of stress for many, and some may fall into depression or anxiety. In this talk, Dr. Emily Ho will bring us through how we can better prepare ourselves for these role transitions. Learn how you can reduce to risk of getting depression, anxiety and memory impairment in your later life step-by-step. With advancement of age and with the unhealthy lifestyle choices of today, ischaemic heart disease (IHD) remains the top disease anywhere in the world. 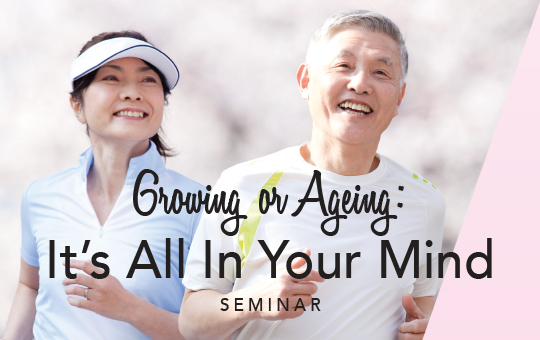 If you would like to live well beyond your 4th decade of life, let Interventional Cardiologist, Dr Julian Tan, share with you the ins and outs of IHD, especially on preventive measures and treatment options. A compliment naturally brightens our day and generates positive sentiment. We receive compliments when others observe positive traits in our appearance, behaviour and communication or ABCs in short. Developing self-respect and cultivating an attractive personality also helps lift our spirits and make us forward-looking. Delivered by Imageworks’ Senior Consultant Cindy Tien, the session finale offers valuable takeaways on how you can enhance your ABCs, unlocking the doors to greater opportunities and happiness in life. Fee include a goodie bag* worth $80 for every attendee. For more information, please call 6280 6690. *Terms and Conditions apply. Organisers reserve the right to substitute products with a similar value without notice. Information of the seminar is correct as of 3rd August 2017.